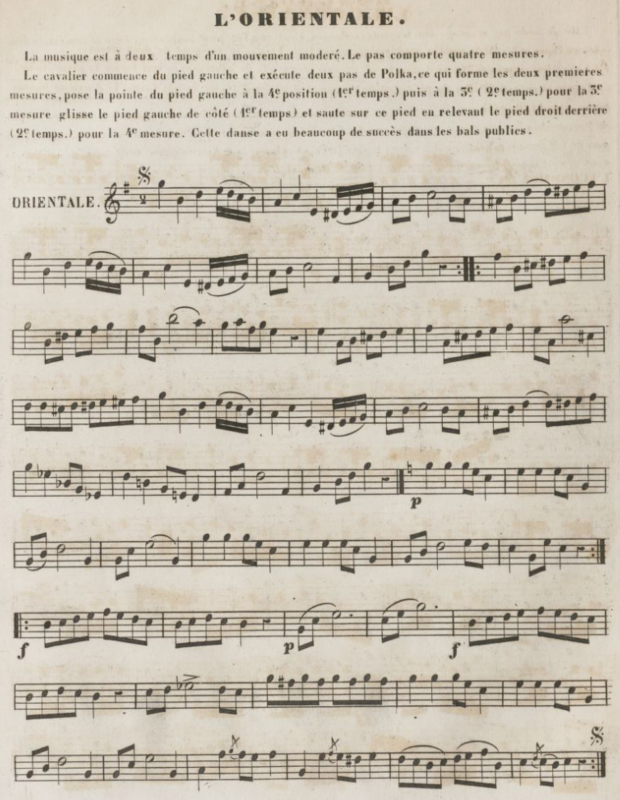 A cross between the Bohemian Polka and Varsovienne, this mid-19th century polka variation was described as both "lively" and "graceful." 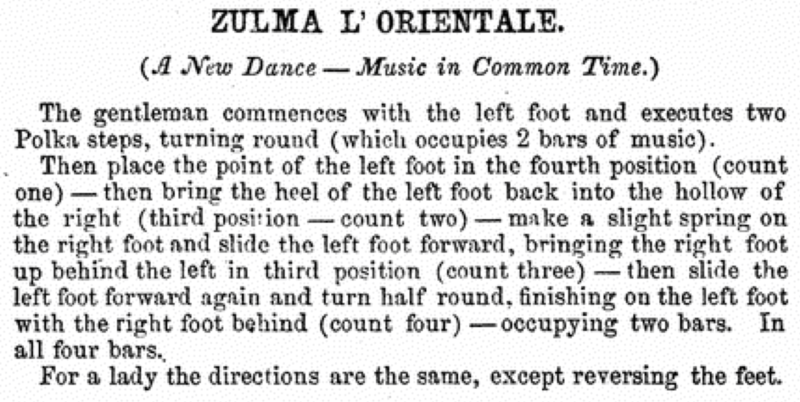 It was likely introduced around 1858, as it was one of the few dances added between the publication of Thomas Hillgrove's 1857 and 1858 manuals. 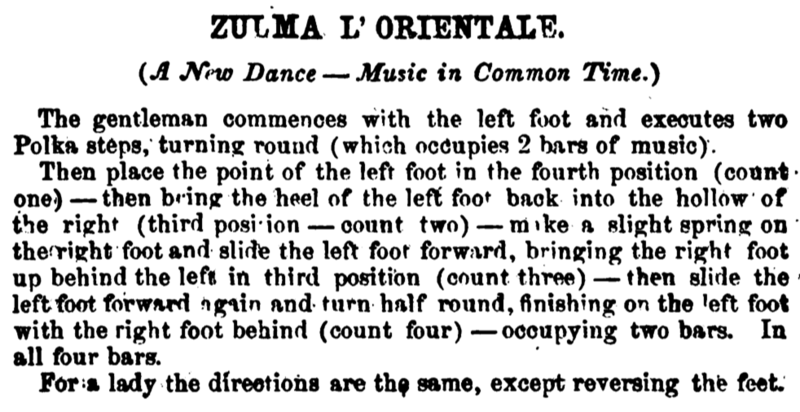 Music for the dance was also advertised as being new in 1858. 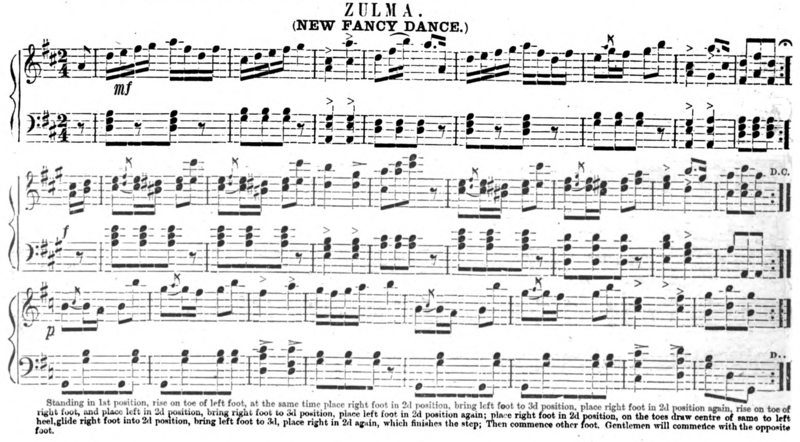 The name is likely taken from the character Zulma in Rossini's early 19th century opera L'Italiana in Algeri. At the time, Algiers was considered part of the Orient. 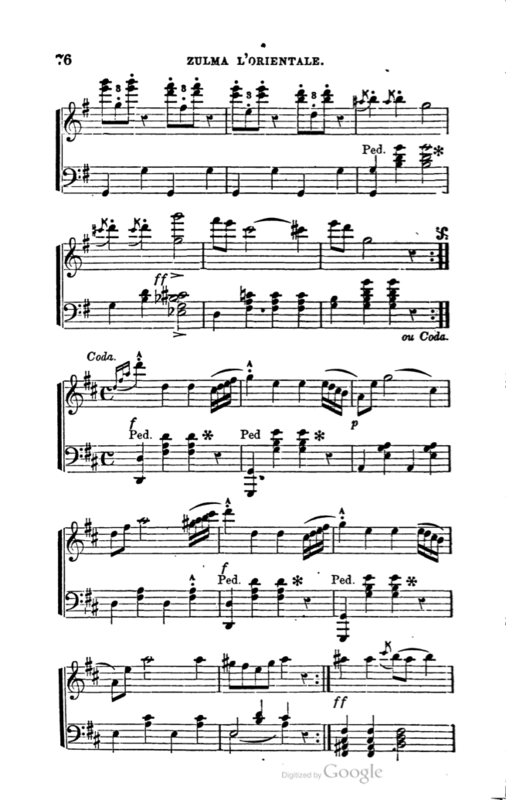 One full turn of polka (1-and-2, 3-and-4). 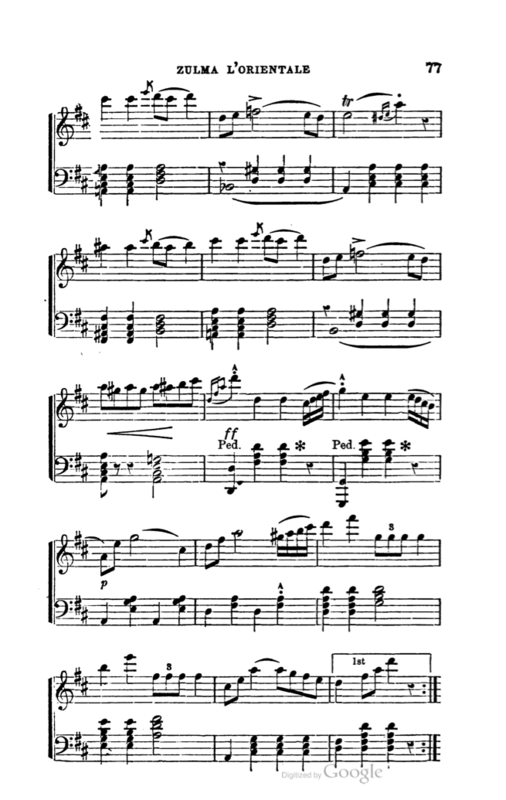 * An alternate version ends with a half-turning slide-hop (7, 8) [EF59, JR61, CB66]. Repeat opposite to finish the turn. Hillgrove and Ferrero note that this, like most turning variations, can be reversed, turning to the left instead of the right. 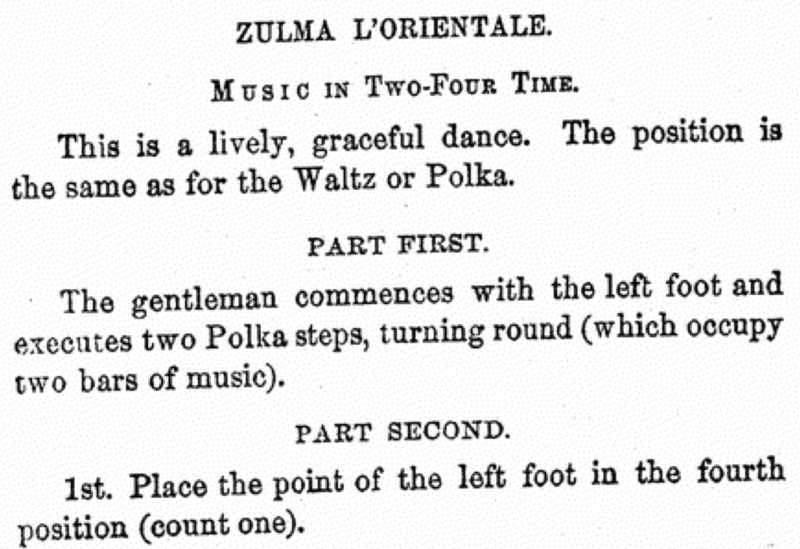 Several sources (e.g., Ferrero 1859, Renausy 1861, Howe 1868 & 1880) provide music specifically for the dance. Click "See Original Description" below to see them. TH58 — Thomas Hillgrove. 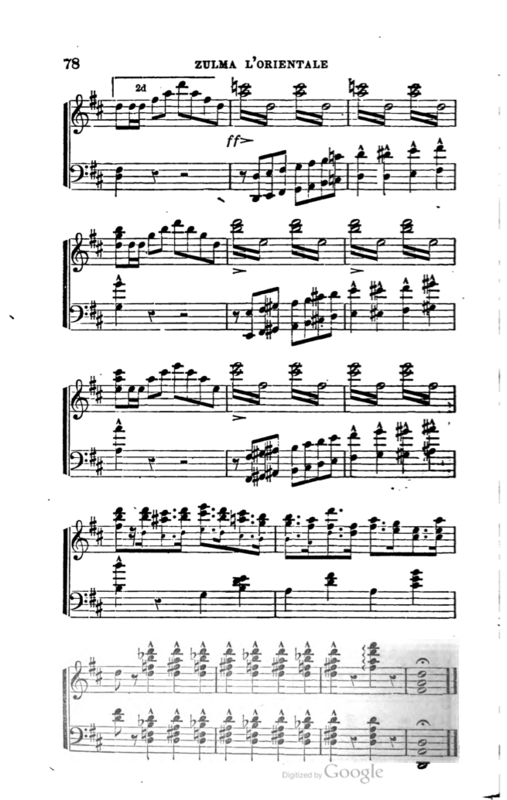 (1858). Hillgrove's Scholar's Companion and Ball-Room Guide. New York. JR61 — [Jacques] Renausy. (1861). 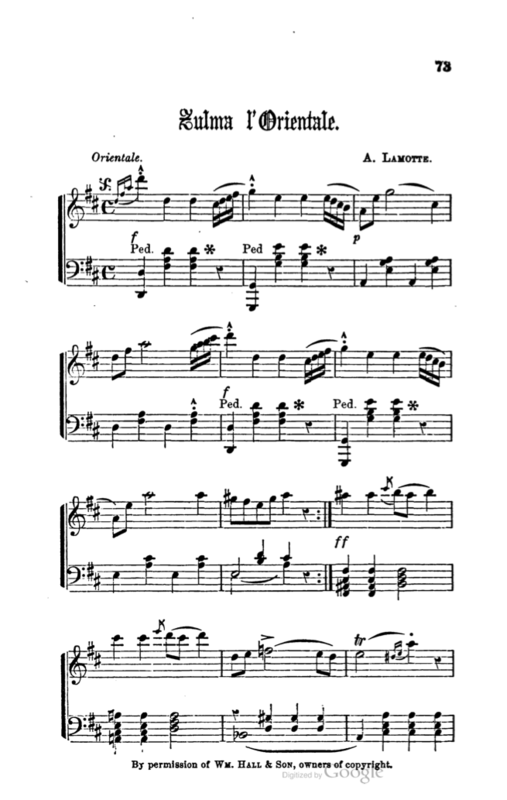 Méthode de Danse. Paris. TH63 — Thomas Hillgrove. 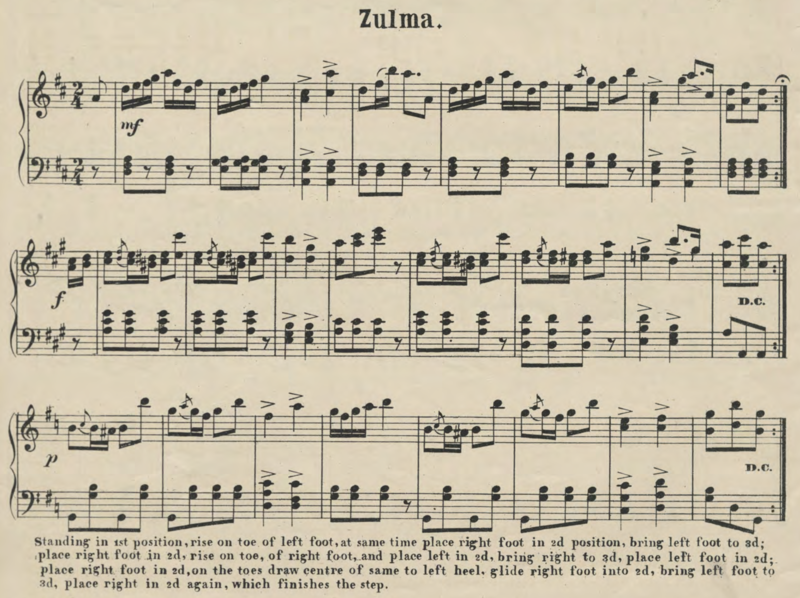 (1863). 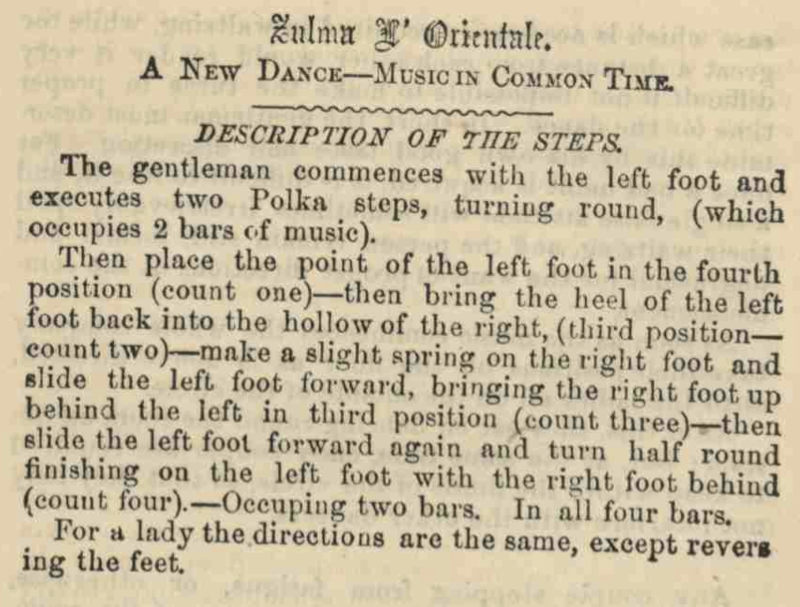 A Complete Practical Guide to the Art of Dancing. New York. CB66 — Charles Brooks. 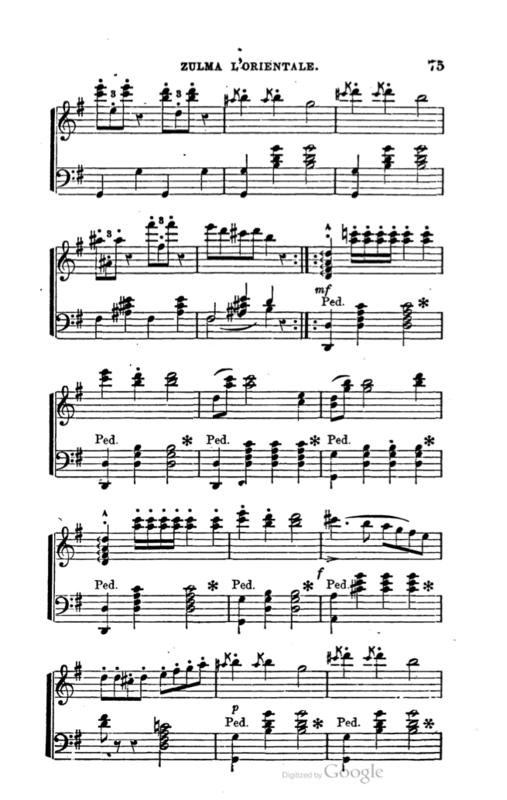 (1866). The Ball-Room Monitor (Third Edition). Philadelphia. TH68 — Thomas Hillgrove. 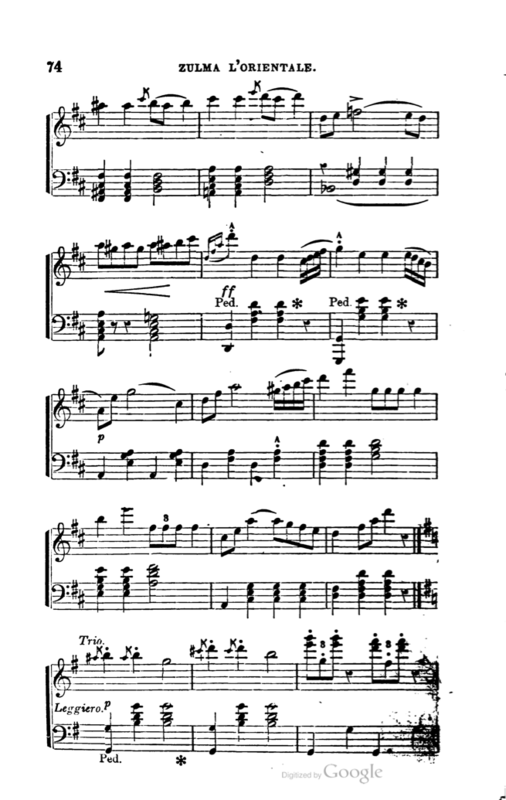 (1868). 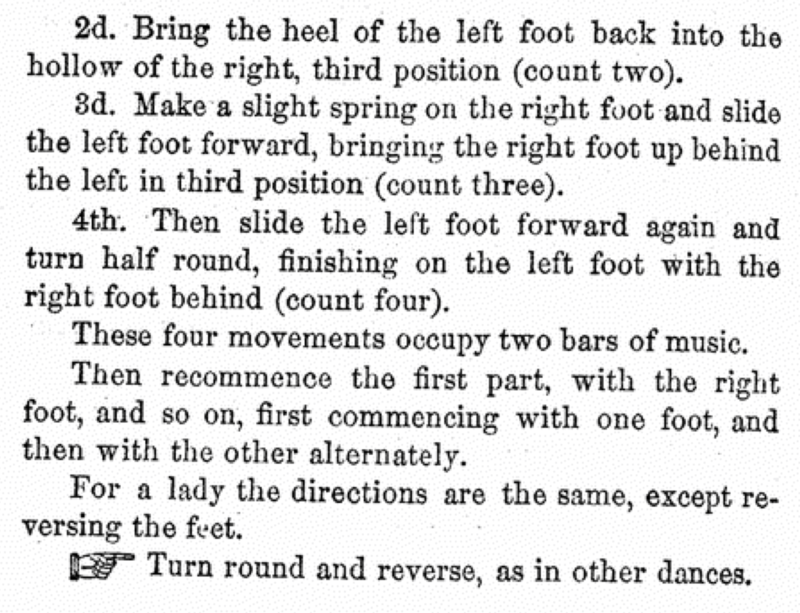 A Complete Practical Guide to the Art of Dancing. New York.